Charlie is struggling to rebound after his dad’s death in this well crafted, middle grades verse novel full of comics, basketball, and a strong family center. 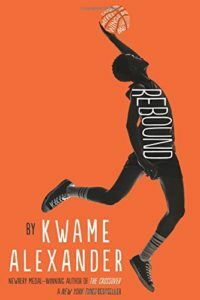 Rebound by Kwame Alexander. HMH, 2018. 416 pages. Charlie Bell just can’t rebound after his dad’s sudden death from a stroke. He’s not interested in playing ball with his best friend Skinny. His best friend-that’s-a-girl, CJ, can’t cheer him up either. And his mother is fit to be tied since all Charlie wants to do is read comics in his room. So she ships him off to his grandparents in Washington, D. C., for the summer, hoping Charlie gets the structure he needs with them while she has to work. Structure is one word for it! Charlie’s no nonsense grandfather calls him “Chuck” from day one and believes that you work first, eat second. Charlie’s cousin Roxie, a truly talented basketball player, refuses to believe that Chuck is no good on the court, and drags him to fill out her team one day. The rest, as they say, is history. Fans of Alexander’s Crossover (we sure were!) will especially enjoy this companion novel. Alexander’s poetry game in this verse novel smacks of rhythm and basketball even as it packs an emotional punch. Short, graphic novel-style chapters interspersed with the verse format effectively illustrate Chuck’s growth and frustrations. Chuck’s maturation as a character and as a young man is well crafted, but his relationships with his family and best friends really shine. There are no easy roads out of grief, and Alexander doesn’t give Charlie one; the novel ends on a hopeful note, though, and the epilogue that takes place in 2018 is a lovely ending. Family and friends often play a key role in our dealings with grief; it’s a shame that more credit isn’t given to the spiritual work and help also needed for grief recovery. There are a few cultural anachronisms, but most kids won’t pick up on them; they don’t spoil the story in the least! Charlie is Josh and Jordan Bell’s father (from Crossover), but readers can read Rebound first (as long as they skip the final chapter dated 2018!). We’ve reviewed several of Kwame Alexander’s novels. See our reviews of Crossover (starred review!) and Booked, two novels that coordinate with Rebound. Just wondering what the theme was.